Ecuador features many different geographies, from snow capped active volcanoes, lush jungles, to coastal plains. These varied conditions provide a fantastic place for growing many types of fruit. Fruit lovers will discover, along with all the common tropical fruits, many new varieties of fruit not imported or found in North American stores. We have expanded our original article c 2009 on exotic fruits as we have discovered and become familiar with more types of exotic fruit grown here. We have now personally grown many of these different exotic tropical fruits. Ecuador is the largest exporter of maracuya (passion fruit) concentrate in the world and of course the world's largest exporter of bananas. Here is an alphabetized list of the many more exotic fruits grown here, and very often unique to this part of the world. A member of the cucumber family, this vigorous climber is grown and popular with the Incas. Best eaten when they are under 2 cm long as they will be soft and tender. Eaten raw it tastes somewhat like a cucumber and if stir fried it tastes like a sweet green pepper. Native to southeastern Asia, the Dutch introduced this fruit to South America. Grown in the coastal areas this evergreen tree grows to a height of 20 meters. The aromatic flowers of the achotillo are very attractive to many insects and especially bees. The skin is reddish and leathery and is covered with fleshy pliable spines. 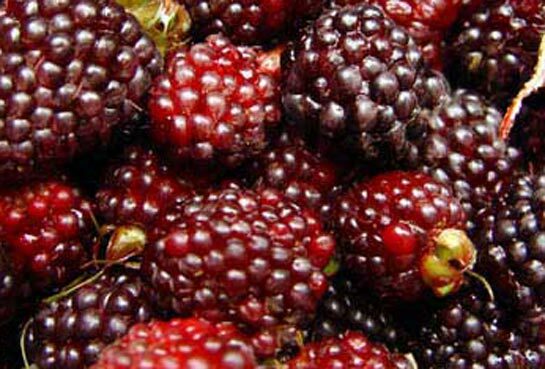 The fruit is an oval single seeded berry which grow in a cluster of about 10 - 20. The flesh of the fruit is translucent, whitish or very pale pink in colour, with a sweet mild acidic taste something like that of a grape. Achotillo fruit contains modest amounts of diverse nutrients. This fruit tree is native to the Amazon Rainforest vegetation of Brazil, Colombia and Ecuador. It is yellow and the size of a softball. 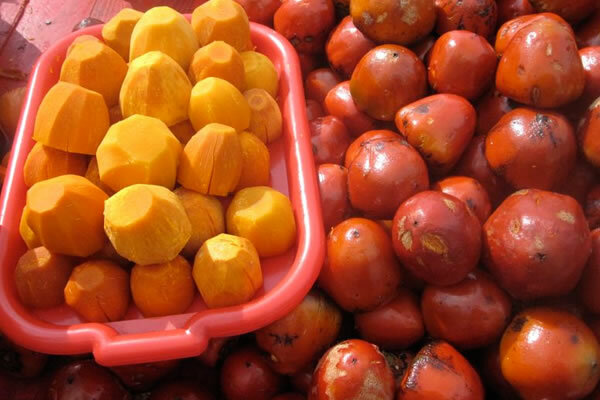 The fruit is very acidic, sour and is processed into juices, nectars, jams/jellies/marmalades, preserves, desserts, and ice cream and has an exotic refreshing flavour. Due to its thin skin it is not exported. The babaco fruit is a bright yellow smooth skin, pentagonal shape, with five distinctive sides, rounded at the stem end and pointed at the apex. The fruit reaches a length of about 12 inches long and 8 inches wide. The fruit is seedless with flesh that is very juicy, slightly acidic, and low in sugar. Its flavour is a combination of strawberry, papaya, kiwi and pineapple. It is popular not only for the fruit & juice but also to make a dessert called Dulce de Babaco. It makes a wonderful pie filling and goes great with apples or strawberries in a pie. Found in Ecuador's Esmeraldas Province this fruit tree requires high rainfall and shade. The round tennis ball size fruit has a green exterior shell with dense brown pulp and lots of seeds. The fruit is used in juices, ice cream, jams & jellies, wine, desserts and traditional medicines that have supposed aphrodisiac effects. 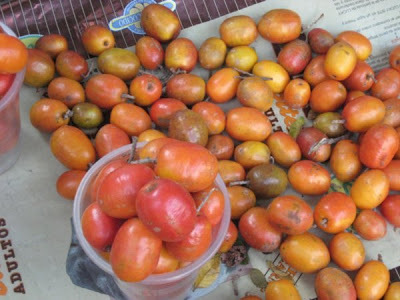 The borojo fruit contains high levels of protein, calcium, iron and ascorbic acid with very high levels of phosphorus. 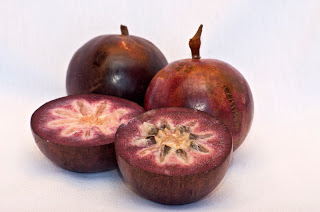 This tropical fruit is round, measures about 2 to 3 inches in diameter, and exists in three colours yellow, greenish brown and dark purple. The purple fruit tends to have denser skin and texture, the greenish brown fruit has a thin skin with a more liquid pulp, and the yellow fruit is less commonly found. 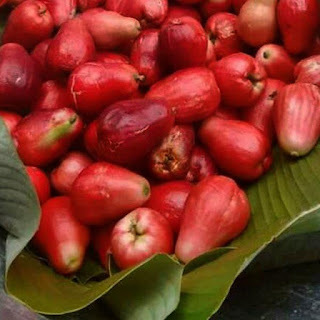 The fruit is delicious dessert fruit and is sweet when served chilled. 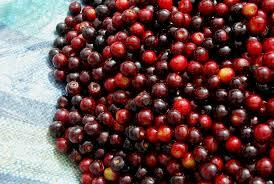 This small maroon-black cherry is common in the Andean and Central American regions. These cherries are an aromatic, round fruit, red coloured with a green tint to nearly maroon-black, with smooth and tender skin. The juicy, light green, firm pulp is typically sweet with some astringency similar to wild cherries. The pit is proportionately large compared to the small fruit. Thus while it can be eaten raw, it is more commonly stewed, preserved whole or cooked down into jam. It also makes a unique filling for tamales. When these cherries are peeled, seeded, and cooked they can be mixed with milk or heavy cream flavoured with vanilla and cinnamon as a dessert. These cherries can also be fermented into a tangy wine-like alcoholic beverage. 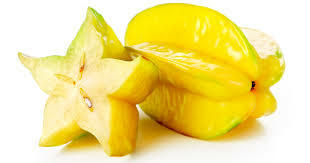 This bright yellow smooth skinned fruit is named for its 5 distinctive ridges whereby the cross section resembles a star. The flesh is crunchy, firm, and extremely juicy. It is edible raw, and used in salads, relishes, and preserves. 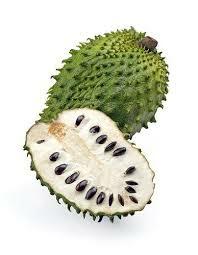 The cherimoya is related to the guanabana/soursop. 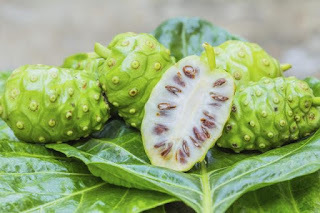 A cherimoya has a intense, delicious white vanilla, mango, pineapple flavoured pulp that is in a green mottled skin and can be the size of a small melon. The white pulpy flesh is full of black seeds which are large and smooth and are easily removed. The chontaduro fruit or "palm peach" grows in clusters on a palm tree. Similar in colour only to the traditional peach, the chontaduro must be cooked before it is eaten. It is high in nutrients. This round red, thick-skinned fruit, about the size of a grapefruit is full of hundreds of seeds. Dried seeds can be used in many culinary applications, such as trail mix, granola bars, or as a topping for salad, yogurt, or ice cream. 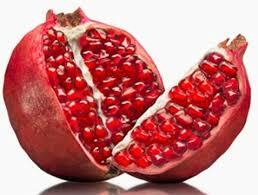 Pomegranate juice is used in cooking, baking, meal garnishes, juice blends, smoothies, and alcoholic beverages, such as cocktails and wine. Its most notable use was thickening the juice into the well known syrup grenadine. It is grown on a shrub or tree that can reach 5 meters in height. 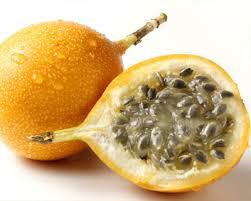 The granadilla fruit is small, pinkish-orange colour, and shaped like an egg. The fruit inside has dozens of black seeds which are enclosed in a gray pulp that is semi transparent. The pulp and seeds can be eaten whole without the skin. Granadillas have a fruity flavour and are very mild. 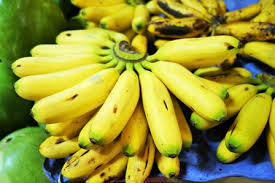 They are a popular fruit here in Ecuador. This fruit is too mild for making juice and is usually eaten fresh. 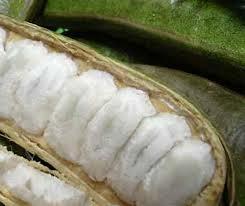 The Guaba Fruit is known as "Ecuador's "Ice Cream Bean" very popular among Ecuadorians for its vanilla flavour. The Guaba ( actually a legume ) is about a foot long, flat, 1.5 inches wide seedpod. When the pod is cracked open a trail of white, cotton candy like fibre surrounds black seeds. This pulp is eaten and the seed spit out, or subsequently roasted. Guaba trees are often used in plantations for shade crops such as coffee or cocao. The fruit is a large spheroid about 7 to 10 cm with a shiny thin orange skin. 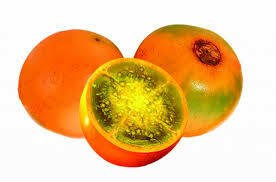 The pulp is bright orange, very aromatic passion fruit aroma and very sour. This fruit makes a very delicious juice, blended with water and sweetened which is very aromatic, bright orange in colour and tastes very much like passion fruit juice. The guanabana's is a large football size fruit with a rough, leathery green outer skin. The inside of this fruit is white with pulp, and is full of many cherry like seeds. The flesh inside the guanabana can be eaten fresh, has the taste of a strawberry and is mild and quite sweet. 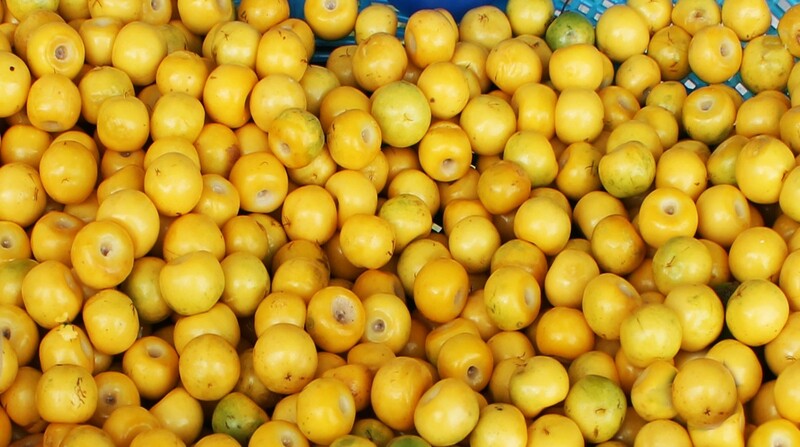 The Ecuadorian people make this fruit into juice, as they can be very messy to eat. 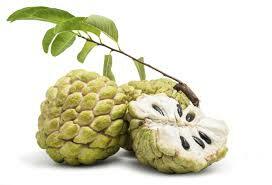 This fruit is widely promoted as a natural cancer treatment. 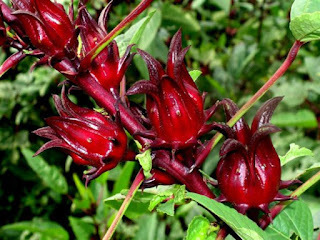 Tea is made from the dried hibiscus flower buds which is high in minerals and has many medicinal properties including reducing high blood pressure. Its flavour is rather tart with a cranberry flavour. Sugar, cloves, cinnamon, nutmeg or rum can be added to taste. Kaki a small orange fruit can be eaten fresh, dried, raw, or cooked. When this fruit is eaten fresh, they are usually eaten whole like an apple or cut into quarters, but it may be best to peel the skin first. 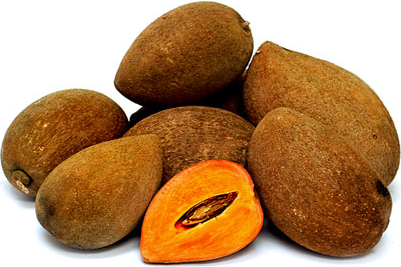 This fruit is used in pies, cookies, cakes, puddings, salads, curries, and also as a topping for breakfast cereal. The maracuya fruit is brilliant yellow with an oval or round shape. 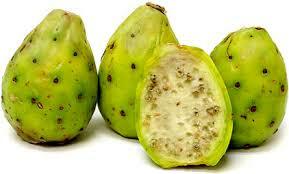 The thick skinned fruit is hollow and filled with dozens of seeds inside which are covered with the pulp. The maracuya can be eaten fresh off the vine and has a very tart flavour. The people in Ecuador put the pulp with the seeds in a blender for a few seconds to make juice and add a bit of sugar (panella is nicer) to sweeten the juice. Blackberries from Ecuador are larger, and stronger flavour than the blackberries that we would see in North America and are grown all year round. In most parts of the country blackberry bushes grow like weeds. Although the blackberries can be eaten fresh, the Ecuadorian people blend them with water and some sugar and make a very tasty juice. 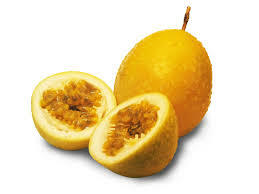 A small, sweet, strongly scented yellow fruit with a pungent and distinct flavour and smell. The taste is not comparable to any other fruits. 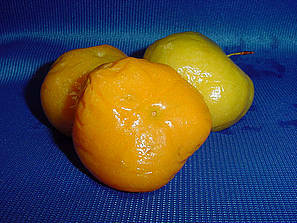 The nance fruit can be eaten raw or cooked as a dessert. The fruits are often used to prepare carbonated beverages, ice cream and juice. 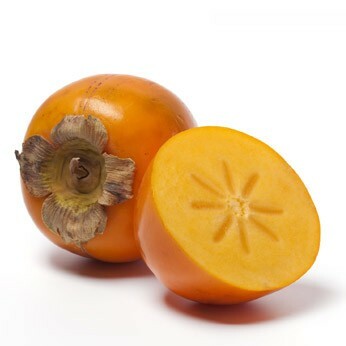 Naranjilla's are a bright orange fruit which is a bit smaller than a tennis ball. The inside of an naranjilla is full of pulp with tiny seeds when strained and sweetened can make a orange-greenish juice that is tangy and leaves an aftertaste that is almost perfumey. Grown on a vine with long and sharp spines it is native to Ecuador and Columbia, and is rarely found anywhere else. Noni, a member of the coffee family, flowers and produces fruit all year round. The green fruit is irregular pear shape. It turns to yellow and then white when ripe with a pungent odour. 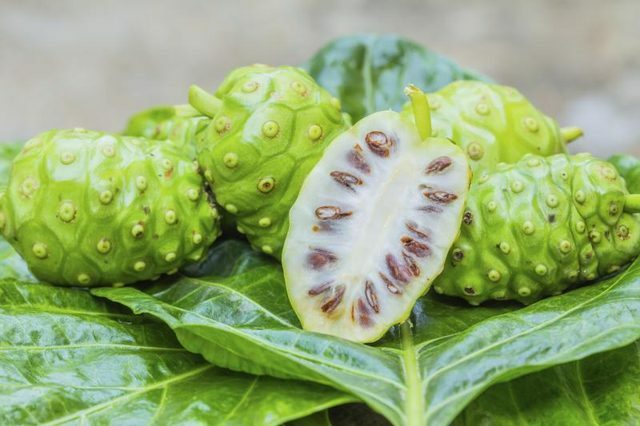 The juice from the noni fruit is promoted as a cure for a number of human diseases including HIV, cancer and heart disease. It is sold in capsule form and pulp powder. A member of the cashew family oboes are oval in shape and when ripened turn red in colour. 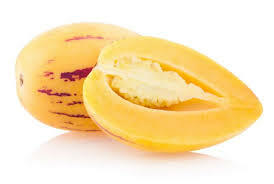 They contain a large single seed and are very sweet when ripe. They are often eaten green with salt - almost like an olive. The fruit contains many nutrients and is widely grown throughout the world. Trees are easily propagated with cuttings and are often used to make a " living fence. " Many different varieties of bananas are grown in Ecuador but the Orito banana is the smallest banana and has a much sweeter, richer, honey like flavour over the other bananas. 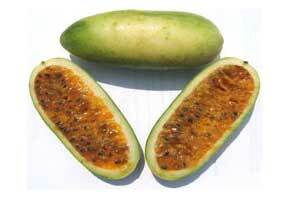 Pepino dulce is an exotic fruit that has a taste that is like a cucumber, cantaloupe, and a honeydew melon. The pepino has a smooth round or oval shape and its colourful skin is light yellow with purple lines. 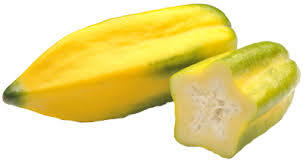 The fruit of the pepino is an orange/yellow colour with juicy flesh. 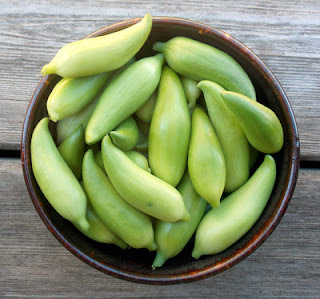 There are also seeds which can be eaten. The pepino is commonly used as a dessert fruit, and combined with other exotic fruits in fruit salads and platters. The pepino can also be eaten raw, provided that the outer skin is removed. The pomarrosa tree reaching heights of 25 to 40 ft, has wide spreading branches which often exceed the height of the tree. 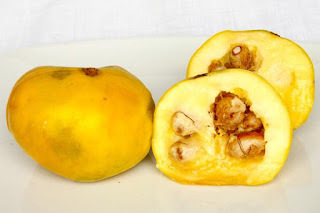 The pomarrosa fruit is almost round, oval or pear shaped, almost 2 inches long with smooth thin pale yellow or white skin which covers a crisp mealy dry to juicy layer of yellowish flesh, which is sweet and resembles the scent of a rose in flavour. In the hollow centre of the fruit there are 1 to 4 brown roughly coated seeds which loosen and will rattle when the fruit is shaken. The sapote is a small fruit with a smooth brown "suede like" tough exterior, when peeled the fruit is a brilliant orange colour. 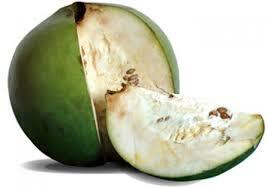 The taste of the sapote is like a fig for sweetness and the texture is more like an avocado and can be a bit stringy. There are 2 - 5 seeds which are inedible in the centre of the fruit. The fruit can be eaten fresh, blended with milk & ice & sugar or water to make a refreshing beverage, can be mashed and used to make custards or smoothies, the sapote freezes very well and can also be used for pie fillings, crumbles and ice cream. An edible brown pod like fruit which is very popular in cuisines around the world. 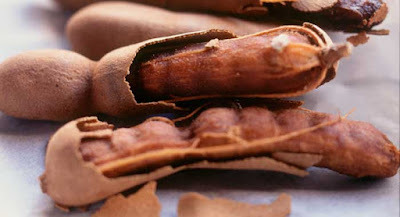 The tamarind fruit is fleshy, juicy with acidulous pulp, described as sweet and sour in taste. The main ingredient in Worcestershire sauce, its extract is used to flavour meats, chutneys, pickles, jellies, and ice cream. Other uses for the tamarind fruit is metal polish and traditional medicines. The taxo is a long soft fruit that looks like a small orange banana but straight. The fruit has many seeds that are covered with pulp which when separated can be made into ice cream or juice. 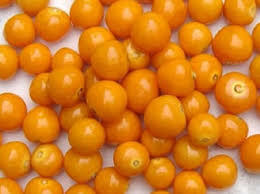 This fruit has a tart tangy taste and is not usually eaten fresh. 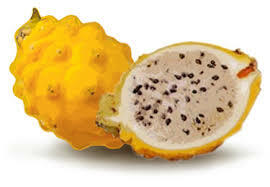 This fruit if eaten fresh can be very sour. The tree tomato's color ranges from hues of yellow / orange to reddish purple and is shaped like an egg. A bit like passion fruit it is full of seeds that are covered by the pulp of this fruit. The tree tomato fruit is commonly used for juice and can be used for a dessert if boiled with sugar. Not be confused with the fish ( atun ) – the tuna fruit is from a cactus which grows all around South America. The tuna fruit's outer skin is green resembling a small cactus with fine spines. When opened there is reddish orange pulp and small seeds inside the fruit. The seeds are crunchy, can be eaten, and are tasteless. 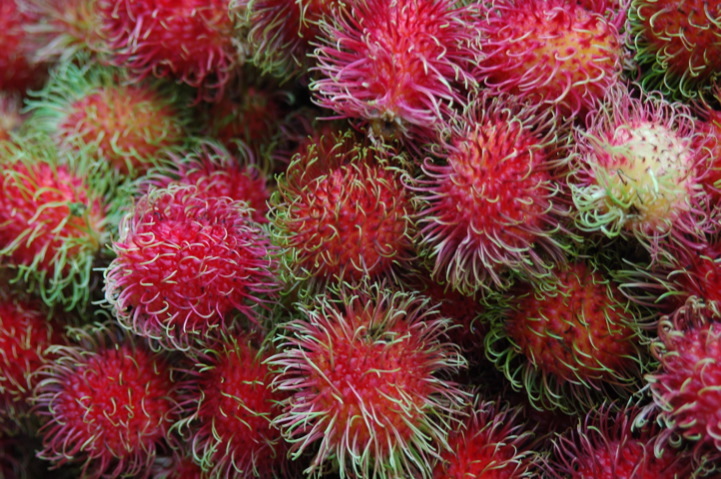 This fruit has a very delicate flavour that is fruity, although bland when compared to other fruits from Ecuador. The uvilla is bright orange and grows inside a husk that is shaped like a small thin lantern. Although cherry like in both shape and size, the uvilla has nothing else in common with cherries as there is no stone, nor do they taste like cherries. 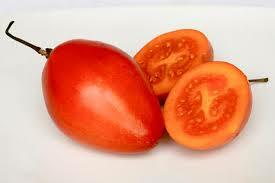 The flavours of the uvilla are something like a pineapple and they are eaten raw. Some studies have suggested that as many as 35% of cancer deaths can be attributed to diet, and that diets high in fats and low in fruits and vegetables contributes to unnecessary cancer deaths. EXCELLENT INFORMATIVE ARTICLE ,BUT I DO NOT SEE MANGOES,COCONUTS OR EVEN CASHEWS ? I've been trying to remember the name of the pamarosa fruit since I left Ecuador when I was 9. Thank you for your article it brought back good memories and the fat kid in me wants some delicious fruit. Thanks for sharing. gift to Pakistan . Thanks for the nice blog. It was very useful for me. gifts to Pakistan .